How Do Ventless Drying Systems on Dishwashers Work? Why Does Steam Escape Out of My LG Dishwasher? There are two common types of dishwashers; those that use steam to clean dishes and those that do not. Even if steam is not employed in the cleaning process, the hot water necessary to adequately clean dishes must escape from the tub through a vent in the front of the unit. Steam escaping from a dishwasher, whether an LG or other brand, is normal and usually does not indicate an operational issue. Steam is created when dishes are dried. 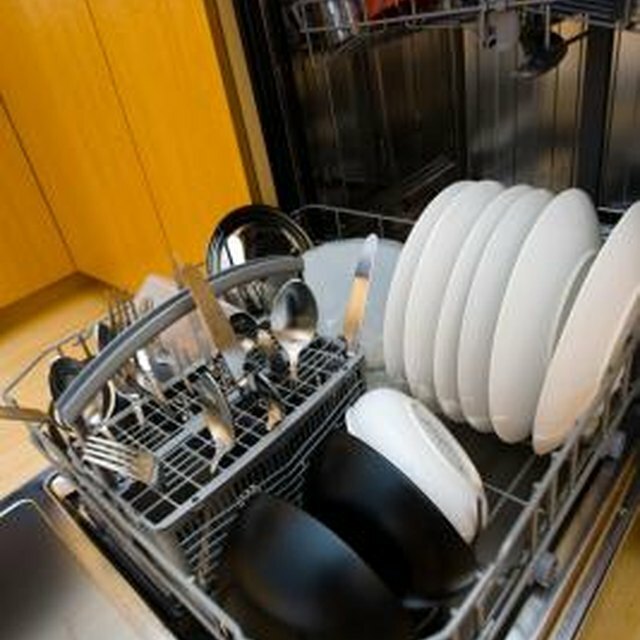 Steam dishwashers employ the power of steam to remove tough stains on dishes. The heat and moisture loosen food particles and disinfect surfaces, leaving dishes cleaner and more sanitary. A heating element raises the temperature of the water and creates steam, which must escape from the dishwasher through a steam vent located on the top or bottom of the door. Steam escaping from a steam-cleaning dishwasher is normal and expected. Water turns to steam when it gets hot enough to vaporize. If your water heater is set to a high temperature, the water may already be steaming when it enters the dishwasher tub. This initial steam, combined with the increase in temperature caused by the heating element inside the dishwasher tub, creates even more steam. Too much heat creates dangerous pressure, which is why dishwasher doors feature a steam vent. When the tub gets too hot, steam escapes through the vent to prevent damage and overheating. Most dishwashers are equipped with a steam-drying feature. At the end of the wash cycle, the heating element temperature increases and causes the water droplets left on dishes to turn to steam and evaporate. During this time you may notice steam escaping from the door vent in order to prevent pressure buildup. Additionally, odors from food particles, water and detergent escape with the steam at this time. Though steam escaping from a dishwasher is normal it can cause damage to certain types of counter and cabinet materials. Wood is especially sensitive to steam, as is linoleum or vinyl flooring and counter top material. Before purchasing a new dishwasher, check the surround and choose a model with the vent located in a convenient position. Alternatively, check your manual for information on how to change the direction of the vent if steam is damaging any other kitchen surfaces.